As questions continue to mount about the origins of the mysterious Mexican flu which is pushing the world into mass hysteria, some are noting that its genetic fingerprint suggests it was created in a laboratory while those who are tracking the small number of confirmed deaths from the outbreak—all of the victims so far being Mexican nationals—are questioning if this is a race-specific bioweapon. While some in the controlled corporate media dismiss such inquiry out of hand, serious researchers know that there is a long and well-documented history of governments experimenting with, deploying and even creating bioweapons to use as a means of warfare, population control and consolidation of governmental power. Biowarfare itself goes back to the earliest periods of recorded human history. The ancient Hittites over 3000 years ago drove plague victims into enemy lands with the intent of infecting the enemy population. Athenians poisoned the water supply of their enemies in Kirrha with a toxic plant called hellebore sometime around 590 BC. Scythians in 4th century BC learned to smear their arrow tips with snake venom, blood and even animal feces in order to infect their enemy's wounds. In the 18th century, the British commander Lord Amherst famously wrote about a plan to infect Native Americans by giving them smallpox-infected blankets, and researcher Kevin Annett has documented similar actions by the Canadian government, which acted in coordination with the Catholic, Anglican and United churches in Canada's residential school system to facilitate the genocide of Canadian natives. Of course, as science began to make progress in understanding and manipulating naturally occurring biological agents, so too did biowarfare become more deadly. The modern age of biowarfare began in earnest in WWI, with the Germans beginning to use anthrax as a stealth weapon against key targets in enemy countries. Accords such as the Geneva Protocol of 1925 attempted to prohibit the use of biowarfare, but that didn't stop any of the major powers, including the Germans, the Japanese, the Americans, the Canadians or the British from pursuing biowarfare capabilities. The excuse was always that these biowarfare programs were merely for defensive purposes, but of course there is no material difference between a defensive and an offensive biowarfare program. - 1932: The Tuskegee Syphilis Study begins. 200 black men diagnosed with syphilis are never told of their illness, are denied treatment, and instead are used as human guinea pigs in order to follow the progression and symptoms of the disease. They all subsequently die from syphilis, their families never told that they could have been treated. Follow this link for more info. - 1950: In an experiment to determine how susceptible an American city would be to biological attack, the U.S. Navy sprays a cloud of bacteria from ships over San Franciso. Monitoring devices are situated throughout the city in order to test the extent of infection. Many residents become ill with pneumonia-like symptoms. Follow this link for more info. - 1955: The CIA, in an experiment to test its ability to infect human populations with biological agents, releases a bacteria withdrawn from the Army's biological warfare arsenal over Tampa Bay, Fl. Follow this link for more info. - 1956: U.S. military releases mosquitoes infected with Yellow Fever over Savannah, Ga and Avon Park, Fl. Following each test, Army agents posing as public health officials test victims for effects. Follow this link for more info. - 1965: Prisoners at the Holmesburg State Prison in Philadelphia are subjected to dioxin, the highly toxic chemical component of Agent Orange used in Viet Nam. The men are later studied for development of cancer, which indicates that Agent Orange had been a suspected carcinogen all along. Follow this link for more info. - 1966: U.S. Army dispenses Bacillus subtilis variant niger throughout the New York City subway system. More than a million civilians are exposed when army scientists drop lightbulbs filled with the bacteria onto ventilation grates. Follow this link for more info. - 1990: More than 1500 six-month old black and Hispanic babies in Los Angeles are given an "experimental" measles vaccine that had never been licensed for use in the United States. CDC later admits that parents were never informed that the vaccine being injected to their children was experimental. Follow this link for more info. - 1994: With a technique called "gene tracking," Dr. Garth Nicolson at the MD Anderson Cancer Center in Houston, TX discovers that many returning Desert Storm veterans are infected with an altered strain of Mycoplasma incognitus, a microbe commonly used in the production of biological weapons. Incorporated into its molecular structure is 40 percent of the HIV protein coat, indicating that it had been man-made. Follow this link for more info. As horrifying as these admitted tests of biological weapons on unwitting subjects are, perhaps even more frightening is the knowledge that governments have a documented history of using biological agents against their own citizens in bioterror false flag operations. It is no coincidence that two of the most well-known and devastating biological releases this decade have traced back to Fort Detrick (the home of the U.S. biological weapons research program since the 1950s and the current home of USAMRIID) and Porton Down (Fort Detrick's British equivalent). In the late Winter of 2001, an outbreak of foot-and-mouth disease ravaged the British farming industry, requiring the government-mandated destruction of millions of animals. The losses to British farmers were nearly incalculable with a number of cases of farmers ending their own lives in anguish over their loss of livelihood. In April of 2001, the Sunday Express reported that the outbreak came just months after an audit of Porton Down—a top secret government bioweapons research facility housing such agents as TB, anthrax and smallpox—found that phials containing foot-and-mouth samples were missing from the lab. Authorities tried to play down the report by suggesting that "animal rights activists" had stolen and released the samples from the maximum security government laboratory. Authorities failed to explain why animal rights activists would be interested in releasing a biological agent that would result in the destruction of millions of animals, or how they were able to penetrate the multiple layers of defenses in the heavily defended laboratory. Just months later, anthrax-laced letters began to show up in the offices of the Bush Administration's most vocal media opponents and political rivals in the U.S. The administration and their puppets in the corporate-controlled media immediately began to theorize that the anthrax used in the letters was a crude concotion that an Al-Qaeda operative could have mixed in a bathtub. It later emerged that these anthrax spores were in fact the most sophisticated weaponized form of the deadly plague ever seen and the particular strain used in its production was traced back to Fort Detrick. It later emerged that key members of the Bush Administration had been on Cipro, the anti-anthrax drug, since the morning of 9/11. The entire story of the anthrax investigation is lengthy and convoluted, but extremely important for a better understanding of false flag bioterrorism. Of course, these are only the well-known examples from the past decade, but naturally there are others (including the 2007 foot-and-mouth outbreak in England, which was also found to come from a government lab). Even worse than these examples is the knowledge that the types of bioweapons that governments around the world have been developing far outstrip anthrax or foot-and-mouth in sophistication and effectiveness. Although the full extent of American bioweapons research remains classified, it is public knowledge that the American military was already experimenting with race-specific bioweapons at least since 1970, a technology that the Apartheid South African government was known to possess and which Israel was developing last decade. It does not take much imagination to envision why those two governments would have been interested in the technology, but it may be surprising to learn that the American government has not only been developing race-specific bioweapons, but that key government officials have advocated their use as a way of furthering American foreign policy. In September 2000 a neocon think-tank called Project for a New American Century released a policy paper, "Rebuilding America's Defenses", that contained the following chilling quotation: "advanced forms of biological warfare that can “target” specific genotypes may transform biological warfare from the realm of terror to a politically useful tool." Prominent PNAC members included Cheney, Rumsfeld, Wolfowitz, Jeb Bush and Scooter Libby. 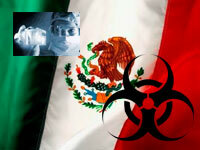 Given all of the foregoing, the suggestion that the current flu pandemic may in fact be a government-engineered race-specific bioweapon is not only plausible, but the first possibility that any rational investigator would consider when examining the never before seen flu strain which only seems to be killing Mexicans. The natural question at this point is not whether the government could do such a thing, but why they would do such a thing. Naturally, governments deploy biological agents for a number of different reasons. The 2001 foot-and-mouth outbreak ushered in a new era of internationally-standardized farming procedures and guidelines in the name of 'food safety' and the protection of trade interests, ultimately leading to such Orwellian programs as the National Animal Identification System (which is now being administered in other countries under different names). The 2001 anthrax attack not only helped to silence Bush media critics and Democrats who showed any sign of resisting the Bush Administration's "War on Terror" policies, but it also ensured the passage of the Patriot Act, which was rushed through Congress as the height of the anthrax scare before anyone even had a chance to read it. So if this new flu is indeed a bioweapon, and if it has been released on purpose, the question remains: What motive would a western government have for this release, especially considering the new flu now threatens the entire globe? The answers to that question are numerous, but can be located in such things as the Security and Prosperity Partnership of North America, as well as the precedent-setting consolidation of power in the hands of agencies like the WHO during this crisis. The Corbett Report will be covering these possible motives behind the attack in a series of forthcoming articles, but for now readers are advised to further familiarize themselves with the concept of false flag bioterror by listening to Episode 060 of The Corbett Report.